While highly regarded and highly rated, Washington red wines have had something of a glass ceiling in Wine Spectator over the years. As noted previously, ninety-six points has been a high water mark for Washington in this publication. In fact, of the many Washington wines reviewed by Wine Spectator each year, only seven wines from three wineries - Cayuse, Leonetti, and Cote Bonneville - have even received a score of 96 points. This spans over 4,000 wine reviews. This is nothing to be ashamed of. Rather it is an indication of the rare air of such scores in this publication. To wit, in the most recent twelve months, only 38 out of 6,127 red wines reviewed by Wine Spectator have received scores of 97 points or higher (0.6% for those keep track at home). That said, no Washington wine has ever been in that group. In its upcoming issue Wine Spectator has awarded Charles Smith’s 2006 Royal City Syrah a 97 point rating. This makes it the highest rated Washington red wine by this publication. 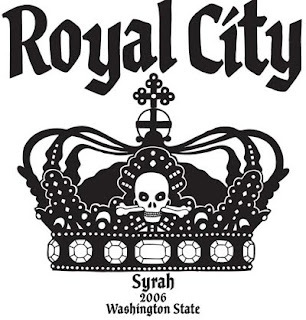 The 2006 Royal City Syrah, released last November and sold out long before that, received a 100 point rating from Wine Enthusiast – its first for a Washington wine – and a 98 point rating from Wine Advocate. This is, quite simply, a recording breaking wine. It is also another feather in the quill-filled cap of winemaker Charles Smith who was also named Wine & Spirits ‘Winemaker of the Year’ in 2009. This rating continues an unprecedented string of recent accolades for Washington wine, most prominently Wine Spectator’s naming the Columbia Crest Reserve Cabernet Sauvignon its ‘Wine of the Year’ in 2009. While some may wonder about the overall significance of such scores and accomplishments, have no doubt. Consumers, retailers, distributors, restaurants, and others who impact the wine industry take notice. So what does all this increased attention mean? It means Washington is entering a new phase in its development as a world-class wine region. Buckle yourself in and enjoy the ride. Is this wine really *that* great? Now I'm afraid to open the one bottle I do have! Let me say this. Wine Enthusiast's Paul Gregutt has been tasting and reviewing Washington wine longer than millennial wine drinkers have been alive. Ditto for Harvey Steiman at Wine Spectator. These scores are not an insubstantial accomplishment. That said, everyone has their personal preferences so it may be an exceptional wine that is not to your taste. Word on the web is that it needs time in the bottle or extended decanting (one comment I read said two days) to be properly enjoyed. I have a few bottles in the cellar that await their destiny but similarly look at them in fear. Let me know if you open your bottle up! The wine is so phreakin' good, I don't know how anyone could keep it around for 2 days. I reviewed it last October and it is the real deal, especially when it was $80, suckas! If you have a bottle, open it! Why hang on to it? What if you die with that bottle still in your cellar? Oh, the regret! Besides, I also have extras. Always willing to wheel-n-deal! Not to mention Jay Miller for Parker (Wine Advocate 98pts)...he also said: "His 2006 collection is as good or better than anything he has done to date, although a tasting of 2007 barrel samples indicate that the best is yet to come.” Just tried the 2007 Royal City and guess what?! Jay was right! Spectacular! So if you're wondering about the 2006, just drink it - and buy lots of the 2007. Anon, your comment and Miller's review provide similar inspiration. Say no more folks, I will crack a bottle open soon. Thanks for the comments! I tasted the wine three times before awarding the 100 point score - my first (and still only perfect score). And at the time (this is now almost a year ago) the wine definitely needed decanting and many hours of breathing time to open up. Paul, thanks for the comment and ideas on decanting. Looking forward to giving it a try. These are great comments. I have two bottles and plan on opening one up here in a couple of weeks for my wifes 30th birthday. The common theme appears to be decant, decant, decant...but two days seems a bit long...maybe two hours. Sean, maybe get a little special virtual tasting going on with this one. Micah, let me know when your wife's b day is. Happy to come over and help share the bottle in person instead of doing the VT! You could spin it to your wife as a 'unique opportunity' birthday present :). Thanks for the comment. Let us know what you think if you open a bottle.